Water harvesting is simply collecting rainwater that falls on your property and then putting it to use around your home or yard-- that's all there is to it! Many Pima County homeowners use rainwater to irrigate trees, lawns and other landscaping. You can substantially lower your water bill, help reduce local flooding and reduce landscaping and property maintenance needs--- all by putting water harvesting ideas to use around your home. Whether you're building a new home on an single lot, designing a major subdivision, or just making a few improvements around your yard, water harvesting can be easily incorporated into your plans. Check out the links below for some ideas on how to get started with your own water harvesting system. We've also compiled a list of other water harvesting resources to help you get started--its easy! On average, Pima County receives about 12 inches, or one foot, of rain per year. As our community has developed, large areas of land have been changed from native desert vegetation to more impervious surfaces such as houses, driveways, roads and parking lots. When it rains, these impervious land areas shed a greater amount of rainfall, which in turn results in more runoff in area washes and the possibility of local flooding problems. While many people may not realize it, those few inches of annual rainfall are a valuable resource. Harvesting rainwater not only helps reduce the possibility of flooding, but it also decreases the community's dependence on groundwater for domestic uses. 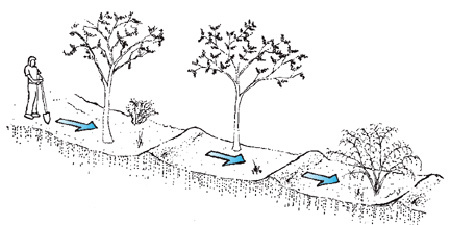 Unlike groundwater, however, rainwater is remarkably pure with virtually no dissolved salts or minerals. Because of this, rainwater is perfectly suited for landscape irrigation, use in evaporative coolers, washing and many other home applications. Using harvested water to irrigate plants, for instance, flushes salt buildup from the soil and produces vigorous, healthy plants. When rainwater is used in evaporative coolers or for washing needs, hardness deposits do no accumulate and there is no problem with soap scum. Imagine not having to scrap your evaporative cooler every year! Harvested water may also be used for personal consumption, but it must be filtered and treated prior to use. By reducing runoff and using rainwater that falls on your property, you can put a valuable water resource to work around your house and yard. Conserves valuable groundwater and reduces your monthly water bill. Reduces local flooding and drainage problems. Flushes salt buildup from soils-- your plants and landscaping will notice the difference! Decreases landscaping and property maintenance needs. Provides excellent quality water for many home uses. 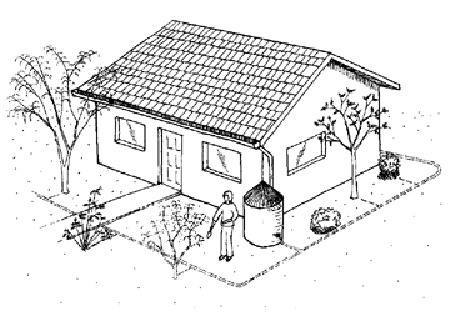 Water harvesting systems can range from the simple to the complex, depending on your needs and budget. Whether you're building a new home on a single lot, designing a major subdivision, or just making a few improvements around your yard, water harvesting can be easily incorporated into your plans. You can capture rainwater from any rooftop area, patio, driveway or other impermeable surface. 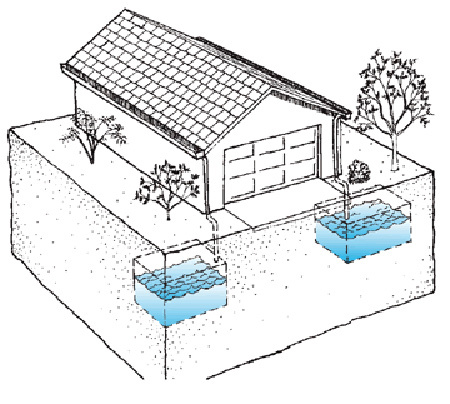 Make sure that collected water is kept at least three feet away from the foundation of your house. The amount of water you'll be able to harvest depends on the size of your catchment area. To determine the amount of water you can collect, multiply the square footage of your catchment area times the amount of rain received each year in feet (about one foot of rain per year in Pima County). Next, multiply that value by .90 to account for evaporation and other losses, and then multiply this result by 7.5 to determine the number of gallons. As an example, a 1,000 square foot catchment area will yield about 6,750 gallons of water per year (1,000 x 1 x .90 x 7.5 = 6,750). Storage systems can vary in complexity depending on your needs. An effective system can involve a 55-gallon drum fed by rooftop gutters and downspouts. A more involved system might include buried cisterns, plumbing and a timed watering system. Debris and leaves should be filtered before storing the water by placing screens over gutters or downspouts. Water kept in tanks or cisterns should also be covered to minimize algae growth and eliminate the potential for mosquito breeding. Placing floating lids on storage tanks is an effective solution. Gutters and downspouts or berms and swales can be designed to catch rainwater and distribute it directly to landscape plants or into tree wells. Rainwater can also be directed to rock-lined trenches or perforated pipes and allowed to infiltrate into the soil. Many people store harvested rainwater and then distribute it later through their regular drip irrigation system. Water harvesting systems require occasional maintenance, but this is easily accomplished. Debris screens over gutters should be cleaned periodically and storage tanks should be drained and cleaned when it is convenient to do so. Click on thumbnail photos for enlarged views. A superb backyard amenity: Three views of a large, multi-level water harvesting pond installed in a resident's backyard. The 100,000 gallon pool stores water collected from the owner's property as well as runoff from adjoining parcels. The pool provides year-round water for all landscape irrigation needs. It also doubles as a wildlife pond, providing the family with many hours of bird watching enjoyment. Resident fish and turtles minimize mosquito breeding problems. At left and center, rainwater runoff is channeled to the collection pond from the driveway surface and from other areas on the property. At right, runoff is also collected from parking and common areas at a nearby townhouse complex (top right of photo) and carried to the pond through an underground pipe. The neighborhood approach to water harvesting has minimized local drainage and sediment problems, and has cut the property owner's water bill in half. A simple but effective way to harvest water: At left, rooftop rainwater is collected from this central city building and diverted to needed areas through berms and rock-lined trenches. Captured water irrigates landscaping at various locations on the property. At right, landscaped areas are depressed to allow water to percolate into the soil. Here are a few resources and reference materials we have found useful in getting started with a water harvesting project. A good first stop for additional information is the Tucson-Pima Public Library. Other libraries, various public agencies and Internet World Wide Web sites are also good sources of information. Tucson Water Conservation Office, Tucson, AZ, c. 1991. W. Gerald Matlock, Tucson Water, Tucson, AZ, 1985. Other water harvesting resources on the internet can be found on our Links page.